In the spirit of Valentine's Day, I thought it would be fun to push this concept a little further with the many ways we can make hearts in HTML & CSS. We can call an image of a heart and set it as the background of an element. See the Pen I Heart You - Background Image by CSS-Tricks (@css-tricks) on CodePen. That's right. We can let the web do the drawing for us. See the Pen I Heart You - ASCII by CSS-Tricks (@css-tricks) on CodePen. We can draw that with a single element, thanks to the ::before and ::after pseudo elements. See the Pen I Heart You - CSS Shape by CSS-Tricks (@css-tricks) on CodePen. Icon fonts got pummeled in a cage match with inline SVG, but they still do the trick here. We would need our heart icon in various font file formats and apply it using @font-face, but we'll use the We Love Icon Fonts site to generate that for us. See the Pen I Heart You - Icon Font by CSS-Tricks (@css-tricks) on CodePen. OK, well, this isn't exactly CSS but we love SVG around here at CSS-Tricks. Let's add a pulse animation just as an excuse to sprinkle in some CSS. See the Pen I Heart You - SVG by CSS-Tricks (@css-tricks) on CodePen. There are undoubtedly more ways we can go about this. Share your Pens in the comments and we'll add them to the collection. And, of course, happy (slightly late) Valentine's Day! If I wanted to make a spinning wheel for http://carssimplified.com/ , is there any gear element that I could rotate on top of a circle to give the effect of a spinning wheel, or would I have to build something really complex with rotating rectangles stacked on a circle? Hey Kelli, good question. I’d likely start with SVG for something like this and animate the paths that need to spin. Icomoon is a good place to start for basic SVG shapes. What about dashed border and transform rotate ? Depending on the needs on the same element or before/after? Just to be clear, this is just a proof of concept. Background gradients are quite terrible when it comes to rounding and aliasing and such, especially in Webkit/Blink where they’re flat-out awful. 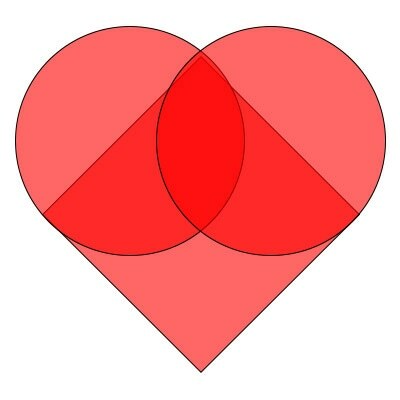 You can even spot a missing dot or two in the middle of the heart, or a whole line in the middle, even if the math behind the composition is fine. Firefox is the client that does gradients the best, but still it’s not perfect. I like your square element with pseudo circle elements to make a heart but i think it could look slightly better using a rectangle with border radius on 2 corners and an ::after element with the same but rotated. Gives it more of a pronounced heart shape. Is this sample some possibility of read as “I you”?